Rudy LaVecchia & ParagonMeds expand operations into LTC and specialty pharmacies throughout Florida and the United States. ParagonMeds is proud to be recognized as APPA's Pharmaceutical Wholesaler of the Year. Order via your mobile phone or tablet anytime anywhere! ParagonMeds had a great time at the Medtrade Conference in Atlanta, Georgia this year. ParagonMeds is a nationwide pharmaceutical distributor located in Weston, one of South Florida’s most desirable communities, both residential and corporate. Paragon has been successfully in business for over 16 years. We are proud to announce the opening of a new distribution center in Memphis, Tennessee. 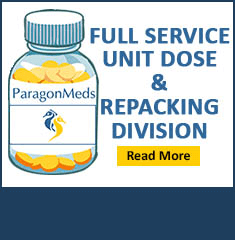 ParagonMeds is proud to announce the official launch of their new and improved website. There are a ton of new features that our customers are going to love. If you have any inquiries, comments or suggestions, please leave us a note on our Contact Us webpage. Hospira on Thursday announced the recall of a single lot of heparin sodium injection in response to a confirmed report of a human hair contaminating the product. Hospitals and health systems try their best to anticipate and meet the demand for specific drugs.But drug shortages – whether due to outbreaks of specific illnesses or unanticipated supply bottlenecks – are a fact of life in the medical world.